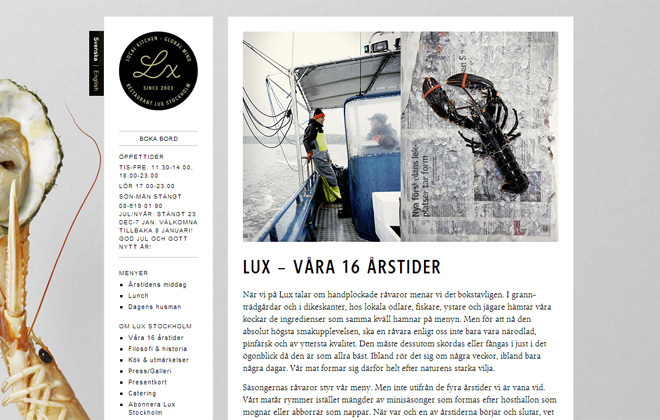 Web site for the restaurant Lux Stockholm. Lux is located at the small island of Lilla Essingen and is one of Swedens topmost restaurant. In 2008 it was named ”the best all round experience” in Sweden by the White Guide, and has since 2004 one star in the Michelin Guide. The support for multiple languages is created using the WordPress qTranslate plugin. Make your table reservation now or have a look at the site at luxstockholm.com.